State-run engineering and consultancy agency RiTES had in 2016 warned the West Bengal government on the precarious condition of several bridges in the city including the Majerhat structure but no action was taken, officials said Wednesday. One of them said that the West Bengal government was about to undertake repair work on the decrepit Majerhat bridge but it got delayed due to bureaucratic wrangles. A section of the 50-year-old Majerhat bridge on the arterial Diamond Harbour Road caved in Tuesday killing one person and injuring several others. According to the official, the government has also decided to form a monitoring committee to carry out a health check-up of all the bridges in the city. "The tender (for Majerhat bridge) is already out for the repair work and the process in on. It has been decided that within a few days a monitoring committee would be formed to look into the condition of all the bridges in the city," the senior PWD official told PTI. 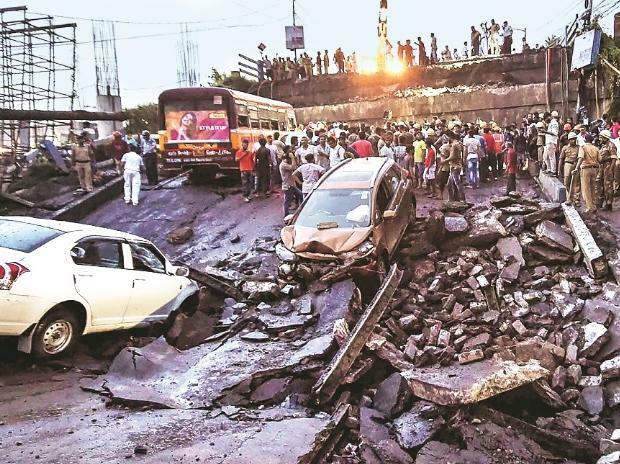 After the collapse of the Vivekanada flyover in the city in March 2016, the state government had mandated Rail India Technical and Economic Service (RiTES) to survey the conditions of different bridges in Kolkata, he said. The under-construction flyover came crashing down in crowded Burrabazar area, the wholesale business hub of the city, on March 31, 2016 claiming 26 lives. "RiTES had warned us about the condition of the bridge and had advised that a repair work should be conducted. But there was no concrete report as such from them," the PWD official said on condition of anonymity. RiTES officials could not be reached for comment. Dipankar Sinha, former DG of Town Planning department of Kolkata Municipal Corporation said the state PWD department had time and again been reminded about the poor condition of the bridge but the warnings went unheeded. "When painting the bridge in blue and white is a priority, repair and maintenance works ought to take a back seat," Sinha told PTI. Bridge experts in the city feel that lack of proper repair work of the Majerhat bridge had led to its collapse. Arup Guha Niyogi, a professor of civil engineering department of Jadavpur University, said if the standard operating procedures for the repair and maintenance of the bridge were followed, the accident could have been averted. "There is a stated operating procedure in terms of repair and maintenance, it should have been followed. Moreover, as initial news reports suggest, the road surface was metalled again and again. The rule is: you need to remove the layering every time you repair and put up a fresh layer. But this was not done in this case which in turn created a pressure on the bridge," he said. A new bridge needs to be inspected every three months for first two years, in order to see whether there are any flaws in its design. After two years, it is mandatory to conduct repair work in old bridges every year, Niyogi said. Two persons still remained untraced Wednesday as search and rescue operations were stepped up in Alipore area in south Kolkata.